 Welcome to Snack Talk, our hub for talking about, well, take a guess. We're so obsessed with snacks that we're gabbing about them with celebrities in our Snack Talk video series AND we're totally eating a Caramello right now. Enjoy! If only I knew what I know now when I was younger. I wouldn't have crippling debt, extensive scar tissue on my left weenis (don't assume, look it up), and I certainly would have approached my two-and-a-half decades of Pringle-popping-to-the-point-of-not-stopping much differently. It doesn't seem that hard to eat a Pringle, right? You grab. You place in mouth. You masticate. This is not rocket surgery. It's just like eating carrots... or actually, pretty much any other food. But last summer, when I visited Pringles HQ in Battle Creek, Michigan, where the air smells like cornflakes and the limo drivers really like Sammy Hagar, I realized I was doing it all wrong. I actually didn't know the "correct" way to consume one of my favorite things. I always knew I was a mouth-breathing imbecile. Now, I knew why. Alas, to err whilst snacking is human. But learning how to snack correctly is truly divine. I righted my Pringle-eating wrongs, and I'm a better person for it. Now you can be a better person, too. 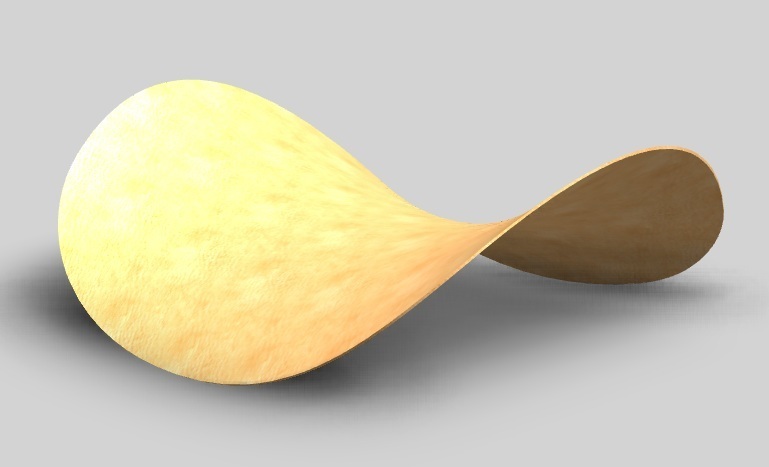 The shape of a Pringle is referred to by the people at Kellogg's, and science in general, as a hyperbolic paraboloid. Now, consider how they are packaged. Stacked more than foot high, with each of the Pringle's sides flared upwards, with the tips sloping downwards -- like the Pringle man's moustache. In this state, the concave of the crisp (they're "crisps," not chips) arch just like this. Remember that. This is important. Now, as my in-office colleagues are still willing to eat random things I give them, for some reason, I asked 10 of them to reach into a Pringles can (the flavor was Loaded Baked Potato, in case you are taking notes) and eat exactly one crisp. Nine of the specimens in this super low-effort survey took a Pringle out of the can, flipped it over, then placed it in their mouth, like this. It fits right on the tongue this way. It's almost primal. It just makes senses -- and it's exactly how I used to do it. But one special young lad -- the Charlie Bucket of this experiment -- was smarter than the rest. Tony Merevick, Thrillist's Executive News Editor (and noted snack-enthusiast), kept the crisp in the same angle as they came originally stacked. He was the lone outlier. So I asked him: why did he choose to put it in his mouth, without flipping, like the rest? "Are you kidding me?" he said, the soft aroma of baked potato-flavoring wafting into my face, "This way tastes so much better. This is how to eat them." He was right. The rest of the group had been eating their Pringles, upside down. You lost? It's cool. Let's get into it. Kurt Simon, director of marketing for the brand -- and the man who originally showed me the error of my ways, back in Battle Creek -- laid out the issue, over the phone. "Really, 'wrong' is in the eye of the beholder. It's like, toilets flushing counter-clockwise in Australia: what's right for me might be wrong for someone else," he said, nailing that Simpsons reference, by the way. "But I will say we've noticed that most people do eat them, as you would say 'upside down,' I think because they fit right on your tongue that way. But that's not necessarily what I do." So then, how does he -- someone who literally does nothing but eat and think about Pringles every single day -- consume them? I heard him pop open a can over the phone, and remove a crisp. "How do I eat them?" he asked, with a crunch (and some polite chewing). "You, and maybe most people, would call it eating it 'upside down,' I would call it eating them the right way." If you are wondering why one side of the seemingly innocuous chip is "right-side up," and one "upside down," let me give you a quick history lesson. 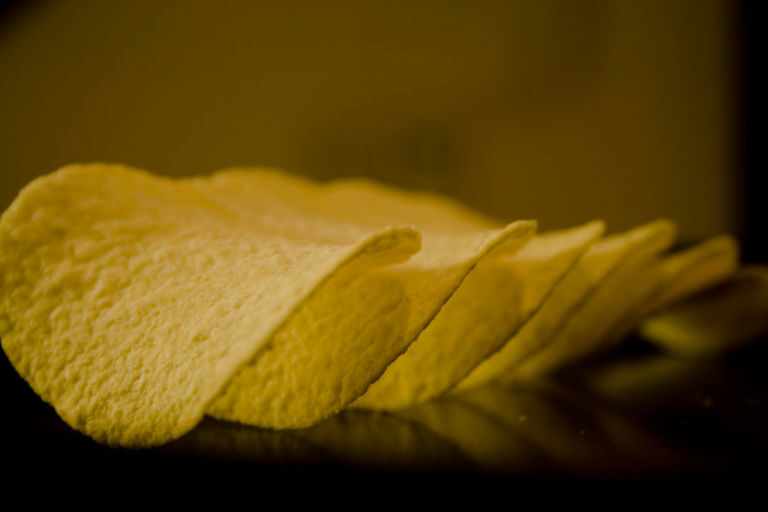 In their unflavored form, Pringles crisps (in this state, called "doughvals") are all the same -- either made of potatoes, or in rare cases, corn. So, all the hundreds of varieties of Pringles are only different because of the mix of flavor powder lovingly placed on the crisps by thousands of tons of shiny factory machinery. From their inception till about 10 years ago, only one side of the crisps even got seasoned in the first place. And now -- despite both sides being semi-dusted on the production line, in their modern state -- one side still get a gets more flavoring, just based on their manufacturing system. You can read more about that here, but it basically boils down to one side of the Pringle getting an extra bout of seasoning on the production line before they are canned. You can probably guess which side of the crisp that is, right? When I had the nine folks who flipped their crisps around taste them again -- but this time, keeping them as they come stacked in the can, what Kurt and I would call "the right way" -- they all immediately noticed the difference. The side that is discernibly more flavored makes direct contact with your tongue -- and you don't need a flavor scientist to tell you why that would matter. It simply packs a brighter, more vibrant punch of flavor this way. It's direct tongue-to-seasoning contact. It's what you want out of life. I'm sorry if your world is shattered. But now you actually know how Neo felt when he figured out his life was a simulation, or when Liv Tyler found out her dad was actually Steven Tyler and not Todd Rundgren (this is a true story). So now I implore you, reader, grab a can of Pringles and try it out for yourself. You will notice the difference, whether you are just eating one lone crisp or stacking them as high as your little heart desires. It's simply the right way to do this. No debate. No question. No doubt. See, you just made yourself a little bit better today!